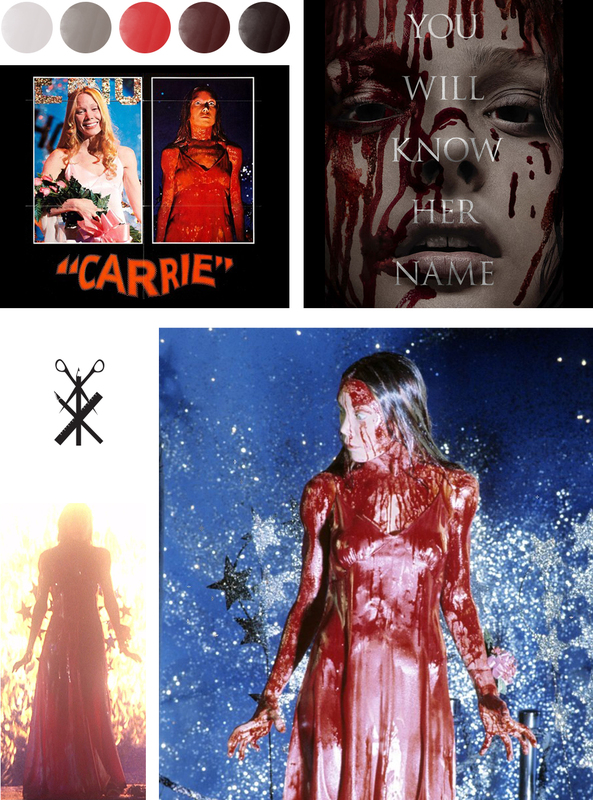 This week’s color palette is inspired by both the new and old version of Carrie. There is a pretty stark contrast between the two films, but they do have a common thread – the infamous blood scene. For that reason the palette is based on…well, I guess it’s based on blood. I distinctly remember the first time I saw Carrie (the original.) I was 9 and walked into the TV room because I couldn’t sleep at my Dad’s house. He was watching the movie, and I walked in right before the bloody prom scene. Traumatizing. I was literally horrified, there’s a good chance there were tears. It’s funny to think back now after seeing the movie again recently. Let’s just say special effects have come a long way since that scene was filmed. I had a similar experience the first time I saw the music video for Thriller. I was about 6 and fell asleep watching TV. In the middle of the night I woke up to dancing monsters and had no idea what was going on. Again – super funny to look back on now hahaha.